Mo'Nique is a multi-media powerhouse whose consistent, extensive body of work has captivated audiences in stand up comedy, television, film and literature. The award winning comedienne's career began 20 years ago after her brother dared her to take the stage for the first time in their hometown of Baltimore, Maryland. She received a standing ovation which instilled the confidence that led to performances on “Showtime at the Apollo,” HBO's “Def Comedy Jam,” “Apollo Comedy Hour,” HBO's “Snaps,” BET 's “Comic View,” The Montreal Comedy Festival and Uptown Comedy Club. Before long, the single mother of one decided it was time to step out on faith and quit her job at the phone company so she could become a star. The next is history.In 1999, Mo'Nique's career took a quantum leap once she landed the starring role as Nikki Parker on “The Parkers,” UPN's hit television series about a single mom who attends college with her daughter. The celebrated family sitcom earned Mo'Nique several accolades, including four NAACP Image Awards for Outstanding Actress in a comedy series in 2001, 2002, 2004 and 2005. Mo'Nique was also the first female to host NBC's nationally televised program, “Showtime at the Apollo” in 2002. She carried the legendary torch for three consecutive seasons. Other memorable television moments include appearances on “Ugly Betty,” “The Game,” “Nip/Tuck,” “The View,” and the BET Awards.Throughout all of her Hollywood success, Mo'Nique never strayed too far away from her comedic roots, which were born on the stage. One of her most notable performances to date is when she starred in the hit stand-up comedy film, The Queens of Comedy, which was released in 2002 by Paramount Home Entertainment and aired on the Showtime Network. 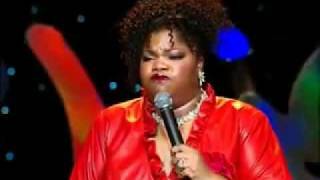 The Queens of Comedy also toured the country, released an album of the same title, and went on to earn a GRAMMY nomination for Best Spoken Comedy Album.Based on her overwhelming fan base of voluptuous women, Mo'Nique has always accepted her role as an influential voice and role model for big girls around the world. She not only embraced this position of purpose, but Mo'Nique also shared her personal perspectives, philosophies and frustrations through her New York Times best-selling book Skinny Women are Evil in 2003. She and co-author Sherri McGee McCovey released a follow-up called Skinny Cooks Can't Be Trusted in 2006 before teaming up again in 2008 for the fictional teen novel, Beacon Hills High.In 2005, Mo'Nique's F.A.T. Chance was created, produced and hosted by Mo'Nique as an original program for the Oxygen channel. Not only was the broadcast America's first full-figured reality beauty pageant but it was also the highest-rated show in the history of the cable network. In 2006, the show earned a NAACP Image Award nomination for Outstanding Variety Special. The Fabulous and Thick competition continued for another two seasons with the third being entirely shot on location in Paris, France. Her relationship with Oxygen continued in 2006 when she hosted a documentary on female incarceration titled Mo'Nique: Behind Bars at the Ohio Reformatory for Women in Marysville, Ohio. While there she also taped her groundbreaking stand up comedy special I Coulda Been Your Cellmate for Showtime television. This project was also released on DVD.Although Mo'Nique had done over a dozen movies prior to Precious: Based on the Novel Push by Sapphire, her Academy Award winning portrayal of Mary Jones, a terrifying, mentally disturbed abusive mother, earned her the Special Jury Prize for Acting at the 2009 Sundance Film Festival as well as Golden Globe, SAG, Critics' Choice, BAFTA and Image Awards for Best Supporting Actress, amongst several others. More film credits include Welcome Home Roscoe Jenkins, Farce of the Penguins, Beerfest, Shadowboxer, Phat Girlz, Domino, Soul Plane, Hair Show, Three Strikes, Baby Boy, and Two Can Play That Game which earned her a NAACP Image Award Nomination for Outstanding Supporting Actress in a Motion Picture, and the Showtime tele-film Good Fences, opposite Whoopi Goldberg.The concept for The Mo'Nique Show which started as a nationally syndicated radio show in 2008 eventually evolved into a late night talk show in 2009, that aired weeknights on Black Entertainment Television. The Image Award winning show pride's itself on being a no judgment zone where urban legends, celebrities and other extraordinary people can make themselves at home in the penthouse while educating viewers and partying like never before. The program was created by Mo'Nique and her husband Sidney Hicks through their production company Hicks Media. The couple also serve as Executive Producers.In the Fall of 2005, Mo'Nique experienced motherhood the second time around with the arrival of twin boys, David and Jonathan. Her older son Shalon was a writer on the Mo'Nique show. All Tickets Purchased Online & Over the Phone Are Subject to a $5 Service Fee. Must be 21 & up to enter; except on Friday's at 10:30pm which is 18 & up to enter.